I’m still here. And I’m still loving it. We’re enjoying a rare, quiet afternoon today, after a pretty full week. I’m slowly reinstating room time for Arddun after a few months off, and Atticus – joy of joys! 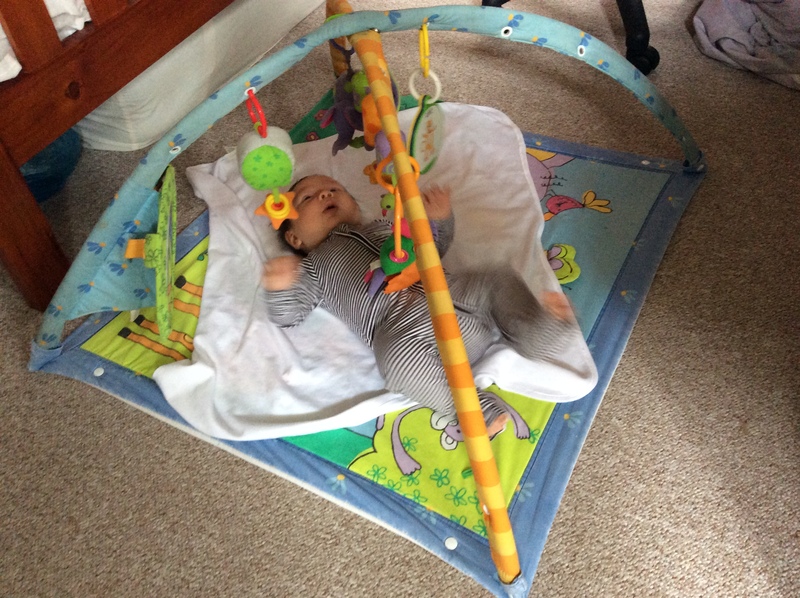 – seems to finally find fascination with play mats. I’m hoping this is the beginning of a beautiful friendship. There have been a few milestones that have come and gone, barely documented by a quick snapshot, let alone lovingly blogged about. That is the life of a mother of a newborn. Perhaps this speaks of my incompetence in sleep training, or perhaps they speak more loudly of our family genetics, but I have been blessed with two babies where sleep doesn’t come easy. Until very recently, Atticus has kept wiiiide awake from 5:00pm until about 1 in the morning. He used to scream through that period until he discovered smiling. He still finds it difficult to settle in the late afternoon, but at least the hours have gradually shortened. On average now, he grizzles from 8:00pm (our dinner time) until 11:00pm at night. Not great, but not bad. Doesn’t lend itself to a blogging habit, however. I’ve missed writing. I’ve taken a few photos, but haven’t found the time to transfer them from my SD card, let alone faff around with file sizes to upload and blog about. I have all these little posts already written in my head, but WordPress doesn’t work telepathically. In the coming weeks, I shall endeavour to fill in the blanks. I’ll probably write and date them retrospectively, if only for my own record-keeping purposes. I’ll leave you with something I read this afternoon while clearing my mail. A man went for a walk on a hot summer day and passed three workers who were making bricks. “What are you doing?” he asked them. In times like these, when the going can seem so slow and the day passes with seemingly little accomplished (no housework, no sleeping baby, no lunch cooked at home, meat not thawed in time so dinner cooked late…), it can be all too easy for me to focus on the literal and the minutiae. I am cleaning poop. Again. I am cleaning spews. My hair just got chucked on. The baby isn’t sleeping. Let’s rock the pram/bassinet/baby bouncer/Ergo carrier. Let’s change the bedsheets. Again. I haven’t even had the time to mull properly over my New Year resolutions. And it’s February. What does it look like? I’m making bricks. Inconsequential, menial, boring as heck. Except I’m building a cathedral. I am part of my children’s lives. I’m capturing their smiles, comforting them after needles, reading to them, singing to them, and breathing them in. I’m growing humans, and not at arm’s length. Not remotely, not by oversight, not by proxy. I am in, arms deep in housework undone, hair shapeless, waist thickened, clothes loose and bordering on frumpy, eyebags loud and proud.